This is a book about fascination, blooming, happiness and sisukkuus (having sisu, nomenclature for having great guts to do something and not giving up, a feature the Finns love to use to describe them). The Power of positive psychology explains us why mindfulness is connected to our well-being and what impact do these sisu, vocation and work engagement have on our well-being. The book advices you how to build your life on your own strengths, and how education, teaching and work can generate joy. In the book there is also some pondering on the question if these guidelines on positivity and happiness are naive. Positive psychology is psychology of well-being. Instead of absorbing in sicknesses and problems, the positive psychology focuses on matters that are unbroken and well functioning in us. 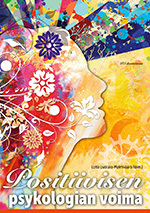 The book is a first one in Finnish to contemplate on a popular scale the many views of positive psychology offered by a set of top Finnish specialists.